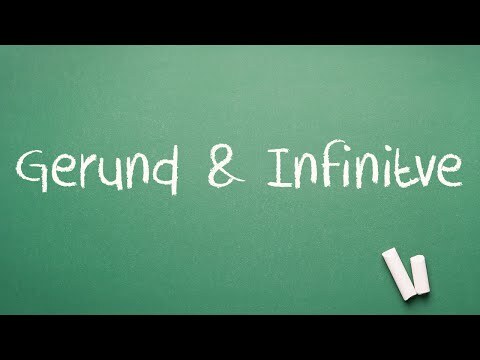 This video shows you when to use a gerund and when to use the infinitive. 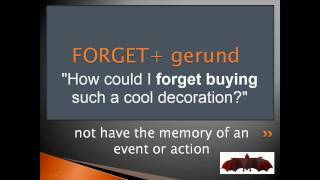 A short video explaining verbs that can be followed by gerunds or infinitives with a change in meaning. Using -ing verb forms after prepositions, to describe and compare things. To describe using verb + object + infinitive (to) or using verb + -ing verb form. Using verbs + infinitive verbs (with to) to describe situations. Using -ing verb forms as the subject of a sentence. 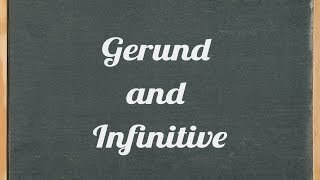 Review how to use gerunds and infinitives. 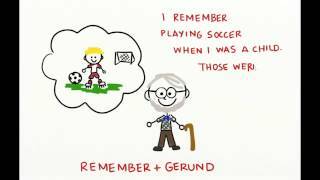 This animation teaches the learner to define, identify and list the uses of gerunds in given sentences. This animation teaches the learner to define infinitives, identify the appropriate infinitives and complete given sentences and list the uses of infinitives. This animation teaches the learner to define and identify full infinitives, bare infinitives, anaphoric 'to' infinitives, split infinitives in given sentences. 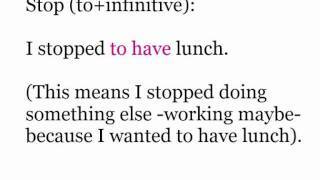 It also teaches the learner to list the uses of bare infinitives.